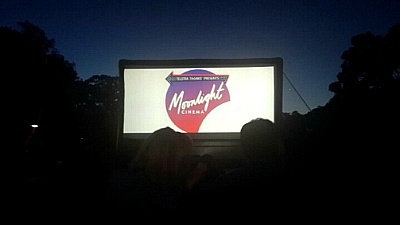 I went to Moonlight Cinema, one of the famous outdoor cinemas in Perth. It was little breezy but not too cold, so it was the perfect weather for an outdoor movie. My friend and I took bean bags that they provide on green grass and waiting for the movie starts. The ticket said the movie starts at 7pm but it started at around 8pm. Maybe, it wasn't dark enough to start a movie. I wasn't bored or frustrated because I could enjoy my picnic, drinks and pleasant time with my friend, but it was disturbing some others. The movie that I watched was 'Escobar Paradise Lost'. It is a romance, thriller about a Canadian surfer, Nick, who falls in love with his dream girl, Maria in Colombia. Actually, Maria is a relative of a very powerful man, Pablo, who gains wealth from drug dealing. It was a sad and tragic story at the end, and a good movie that shows the situation in Colombia. I love outdoor cinema because of its atmosphere and the fact I can enjoy my own picnic. I recommend you to bring a blanket, in case it is bit chilly for you.